The Corsair K70 and K95 RGB are the only keyboard models in this roundup that use Cherry MX switches—a relief for my fingers, after traipsing through Kailh Yellows and Kailh Browns and Romer-Gs and Razer Greens, only to return home to my tried-and-true Cherry Blues. 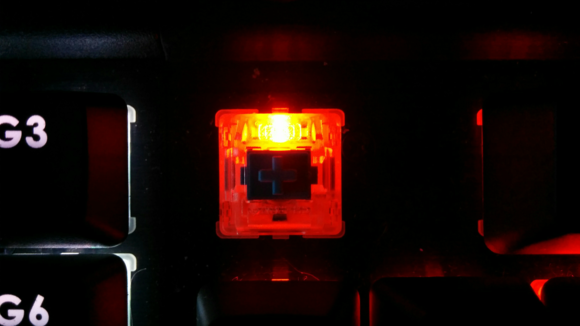 But surprisingly, the real moral of the K70 RGB (and by extension, the K95 RGB) is that switches aren’t everything. 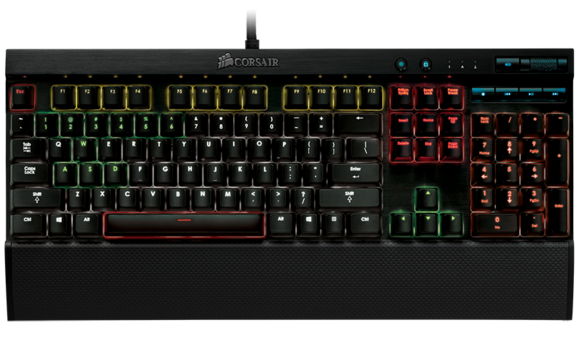 While I love Cherry Blues—they make my fingers sing when typing—Corsair makes some drastic missteps on both the hardware and software sides that undermine what should be a fantastic keyboard. The K70 keyboard is a Corsair classic, with a sleek, brushed-aluminum industrial look that stands out from the competition. The K95 is basically the exact same keyboard, except there are three rows of macro keys attached to the left side. And I mean “attached” in the most literal of ways: The K95 looks like someone took a K70 and pasted an extra piece onto it. It’s not very pretty compared to the stripped-down K70, but if you need the dedicated macro keys that’s your prerogative. 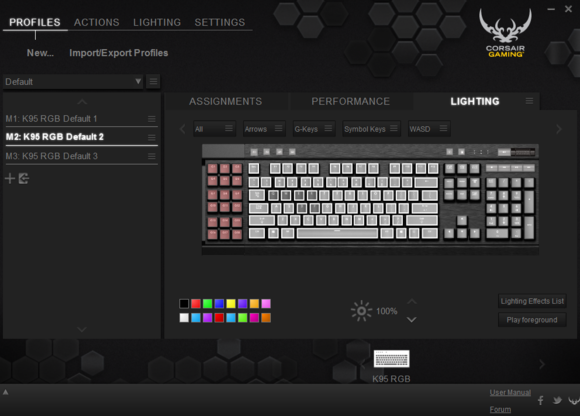 On the other hand, you could just use Corsair’s software to assign macros to literally any key on the keyboard and save yourself some desk space in the process. The K70 RGB also features the new Corsair Gaming logo, though I trust (like my earlier headset reviews, including the Corsair H1500) we can skip arguing over it. You either love it or hate it. I honestly love the K70 RGB in almost every aspect—Cherry Blue switches (or whatever you prefer), an attractive typeface, and one of the best volume rollers I’ve ever used. I love basically every aspect except for the damn RGB lighting. 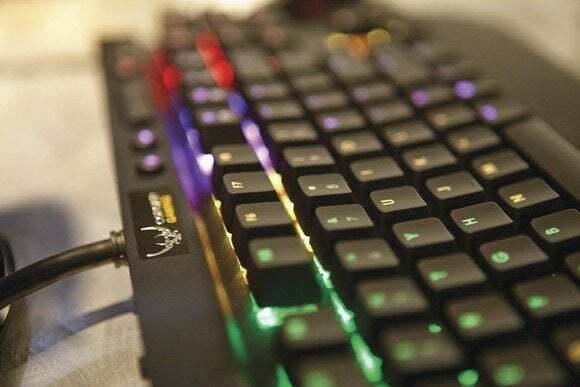 The reason we haven’t had any RGB-enabled mechanical keyboards before this year is that Cherry’s switch design didn’t play nice with the enlarged LEDs necessary for that sort of backlighting. One color? Fine. 16.8 million colors? Impossible. 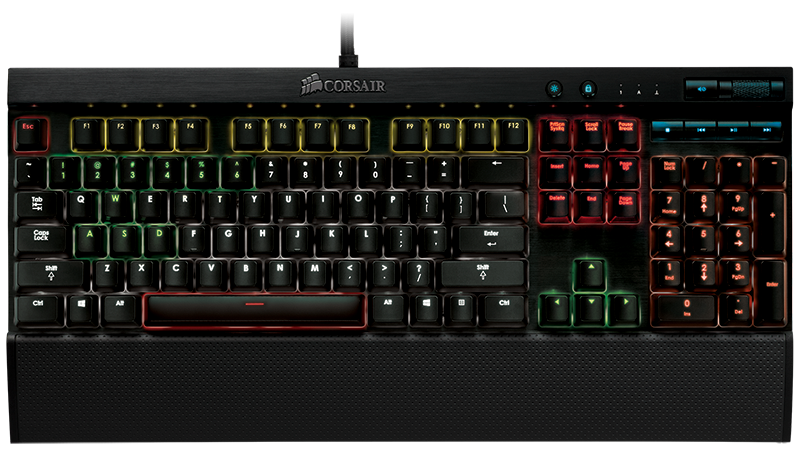 Or at least, it was “impossible” until Corsair and Cherry completely redesigned the underlying switch. The stem—in other words, the most important aspect of Cherry switches—remains untouched. Cherry Blues still feel like Cherry Blues. Cherry Reds feel like Cherry Reds. That’s a relief if the alternative is something like Logitech’s subpar Romer-G switch. There’s a give and take, though. In order to preserve the stem, Corsair and Cherry embedded the LEDs on the board itself and then wrapped the whole thing in clear plastic. If this were a normal keyboard even that might not be a problem. Like earlier incarnations of the K70, however, the keys on the K70 RGB don’t actually embed into the frame itself. Instead, they sort of hover above the base, about a quarter of an inch or so. The K70 RGB has as much light pollution as the Las Vegas Strip. All those pretty colors you set up? They shine right out from underneath each key, through the clear plastic front, and straight into your eyes. It can look cool in a Tron sort of way, but mostly it’s just distracting. The real tragedy of the K70 is on the software side, though. 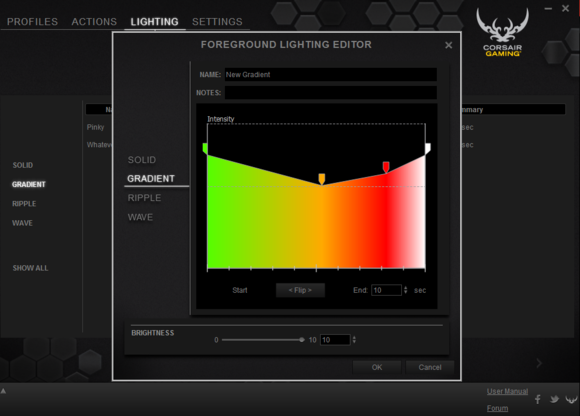 First, credit where credit’s due: You can do some really cool things with Corsair’s software. There’s a lot of flexibility compared to both Logitech and Razer’s offerings. But it’s the kind of flexibility most people will never discover, because it’s an absolute mess of a program. There are no easy presets for someone who just wants to jump in and play around. Instead, you’ve got to immediately delve into a program that hides essential tasks behind multiple menus, doesn’t explain what it’s doing, and is all-around a pain to use. You can’t even change the keys all to one color easily, because the keyboard comes preset with a white-and-red default color scheme. Little do you know that you actually have to delete the groups that Corsair originally set up, or else the colors you’re trying to put on the keys will lay on top of the default colors instead of replacing them. Default color schemes actually need to be deleted or else you’ll simply add your own colors on top. 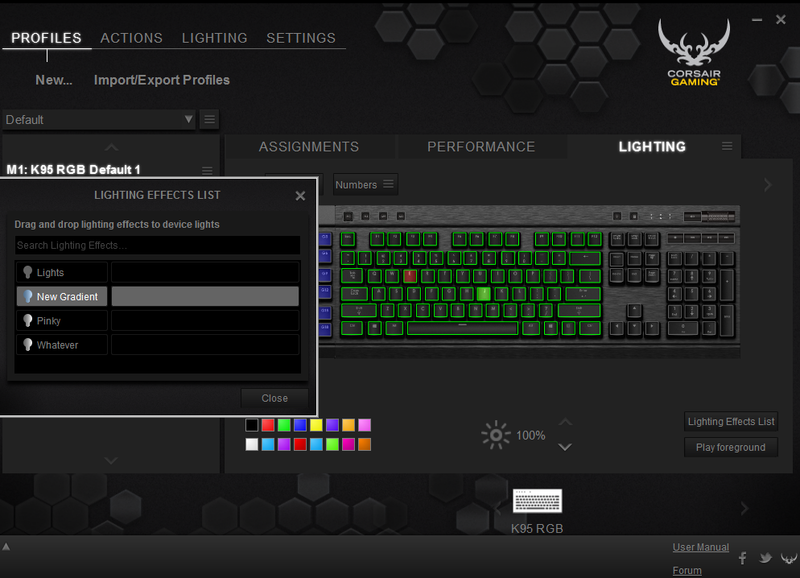 It’s a nightmare, brought on by one of Corsair’s coolest features: The K70 supports layers of lighting. In the background you can set everything as one color, assign lighting to individual keys, or group certain keys together. Then there’s the foreground layer. Here you can assign one of four effects to occur every time you press a key: It either turns a solid color for a certain amount of time, creates a gradient between multiple colors, or spawns a wave or ripple of color. You could, for instance, set it up so the entire keyboard is red, then set it so every time you type, a wave of green goes across the board. Or you could make it so the Arrow keys are never lit until you press them, at which point they turn red for ten seconds. Or you could make the whole board into a psychotropic acid trip, with a million different colors and ripples and waves going off all at once. It’s not like the K70 replaces one color with a different one for these effects. Going back to our red keys, green wave example for instance—the keys don’t just switch from red to green and then back again. Instead, the keyboard melds the two colors as best it can. I say “as best it can ” because while the idea is great in theory—a real winner of a way to show off RGB capabilities—Corsair flubbed something along the way. Instead of a smooth, 16.8-million-color spectrum, the K70 has noticeable “stepping” in color. I don’t know what’s going on here, but I assume that something either hardware or software-related is throttling the color output. It’s ugly, though. Set up an effect that lasts anymore than 5-10 seconds and you’ll notice that it actually steps between three or four values instead of actually creating a smooth gradient. That’s a major issue when you’re trying to sell me on an RGB keyboard. This gradient will never actually look this smooth on your K70/K95. 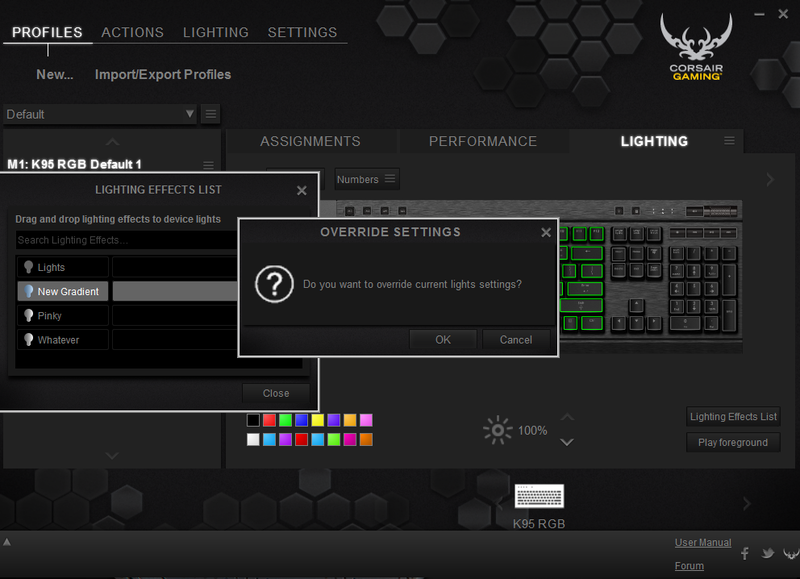 And Corsair’s software is also an unintuitive labyrinth of menus. 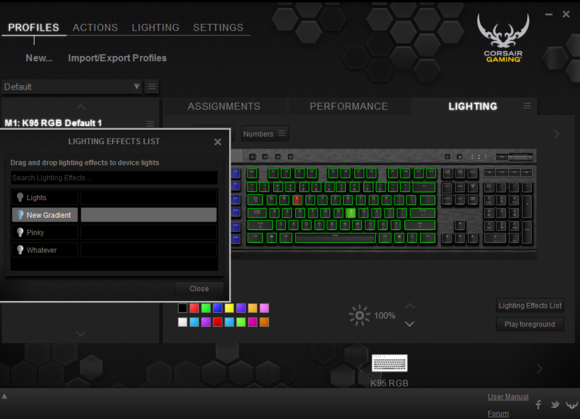 Creating an effect requires you to go to a secondary lighting menu, creating a new effect, then figuring out how to use Corsair’s bizarre line-graph interface (Hint: Right-click) and then figuring out how to change the color of the nodes you made (Hint: Right click again) and then assigning it a name and then finally dragging it onto a group of keys. You can make some great effects. Gorgeous, even, despite the stepping issues. But damn does it take patience. I had high hopes for the K70 thanks to its inclusion of real, honest Cherry MX switches. Those hopes were mostly dashed, however. The K70’s light leakage issues, its stepped-gradient LEDs, and its unfriendly configuration software were enough to offset the benefits of my familiar Blue switches. The stepping issue is something I hope can still be fixed in a future firmware or software update, though don’t take my word for it. If it does, I’d be happy to adjust the score since I think this is otherwise a solid keyboard and could even be great if the issues are fixed. Even so, I’m annoyed it shipped in this condition. If your key feature is 16.8 million colors, you’d better ship with 16.8 million colors.